INAUGURAL FLIGHTS: SPECIAL RAFFLE FOR PASSENGERS WHO BUY TICKETS BETWEEN JUNE 16th. AND JULY 5TH. TEN LUCKY WINNERS GET ONE FREE ROUND TRIP TICKET EACH BETWEEN ANY TWO DESTINATIONS TO FLY ON THE INAUGURAL FLIGHTS ON JULY 8TH, WITH ALL DIGNITARIES. SUPER RAFFLE: ONE FREE SUPER TICKET TO FLY ANY AND EVERY DAY, ANYWHERE MAYA FLIES FOR PASSENGERS WHO FLY BETWEEN JULY 8TH. AND JULY 31ST. 2009 (FOR USE BY WINNER ONLY). ONE FREE TICKET TO ANYWHERE MAYA FLIES FOR EVERY FOUR TICKETS PURCHASED AND USED BY ANY DIRECT FAMILY MEMBER (FATHER, MOTHER, SONS & DAUGTHERS) FOR PASSENGERS WHO FLY BETWEEN JULY 8TH. AND JULY 31ST. 2009. 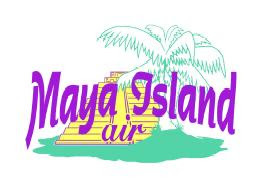 ONE FREE TICKET FOR EVERY FOUR TICKETS PURCHASED WITHIN ANY GIVEN YEAR TO BE USED ONLY BY THE PURCHASER FOR ANYWHERE MAYA FLIES FOR PASSENGERS WHO FLY AFTER JULY 31ST. 2009.